Keller customer says the relationship with his mechanic is based on TRUST – can you say that about yours? We love reviews from customers who speak about specific areas that keep them coming back to Jeffrey’s Automotive. In an industry plagued by mistrust, we find it notable when customers note that they “TRUST” us with their vehicles. This means a lot to us, especially when a customer has been coming to our shop in Fort Worth for a long time. 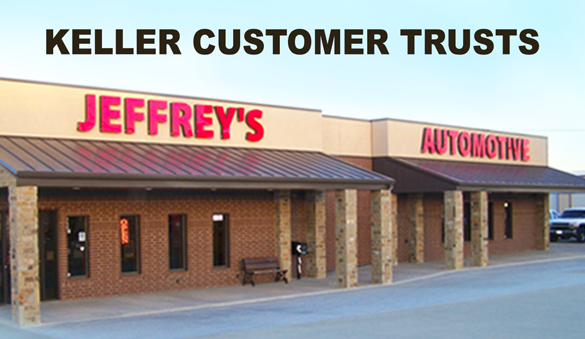 “Jeffrey’s Automotive has serviced all the cars in our family for quite some time. What we like most about this relationship is that it is built on trust. When I take my car in for service or repairs, I know I will get an honest, accurate assessment of what is needed. Recently, I had to use a dealership for an unplanned repair and was told I needed thousands of dollars in repair work. I called Andy at Jeffrey’s to tell him what I was facing. He walked me through in plain English what was going really going on. Having just the bare minimum work done to get the car running again, I took it to Jeffrey’s and got the work done that was needed for a fraction of the cost! I am always VERY SATISFIED when taking my car to Jeffrey’s for regular maintenance of repairs. Recently, I had to use a dealership for an unplanned repair and was told I needed thousands of dollars in repair work. I called Andy at Jeffrey to tell him what I was facing. He walked me through in plain English what was going really going on. Having just the bare minimum work done to get the car running again, I took it to Jeffrey’s and got the work done that was needed for a fraction of the cost! I am always VERY SATISFIED when taking my car to Jeffrey’s for regular maintenance of repairs. Thank you, Jim, for trusting us with your vehicles year after year!